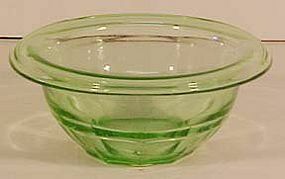 Hazel Atlas Green Mixing Bowl 5-3/4"
Hazel Atlas Green Mixing Bowl 5.75". Pictured in "Kitchen Glassware", 3rd Ed., Pg. 83, by Florence & Whitmyer. Made before the 1960's, in mint condition. Has logo embossed on bottom.